Enter Chelsea Handler. Gorgeous, sharp, and anything but shy, Chelsea loves men and lots of them. My Horizontal Life chronicles her romp through the different bedrooms of a variety of suitors, a no-holds-barred account of what can happen between a man and a sometimes very intoxicated, outgoing woman during one night of passion. From her short fling with a Vegas stripper to her even shorter dalliance with a well-endowed little person, from her uncomfortable tryst with a cruise ship performer to her misguided rebound with a man who likes to play leather dress-up, Chelsea recalls the highs and lows of her one-night stands with hilarious honesty. Encouraged by her motley collection of friends (aka: her partners in crime) but challenged by her family members (who at times find themselves a surprise part of the encounter), Chelsea hits bottom and bounces back, unafraid to share the gritty details. 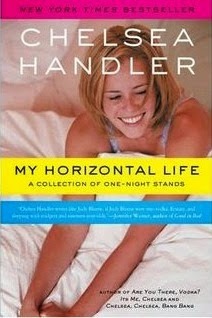 My Horizontal Life is one guilty pleasure you won't be ashamed to talk about in the morning. Wow, this is one of the most boring books I've read in a while. I mean it's no where near the Fifty Shades level of not-worth-reading, but it's still definitely not worth reading. I didn't find it at all entertaining or funny, which is what I was hoping for. It was just boring. I don't recommend you bother reading this.